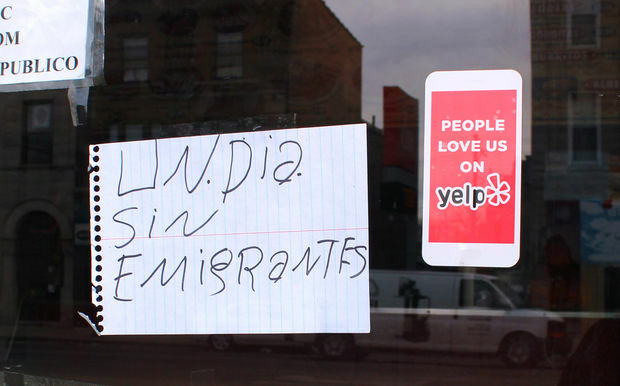 Signs posted on the doors of Pilsen businesses Thursday. 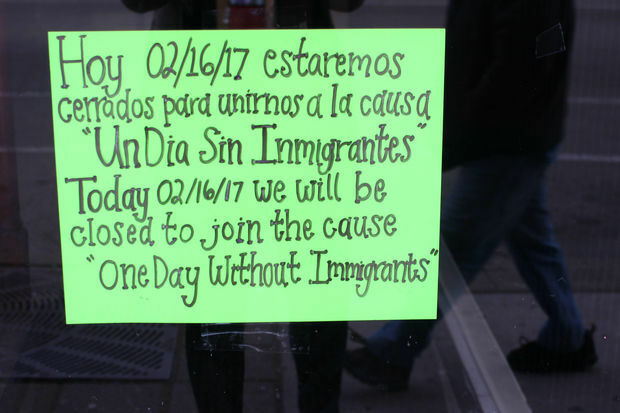 PILSEN — At least 30 Pilsen businesses closed up shop Thursday as part of "A Day Without Immigrants" in Chicago. 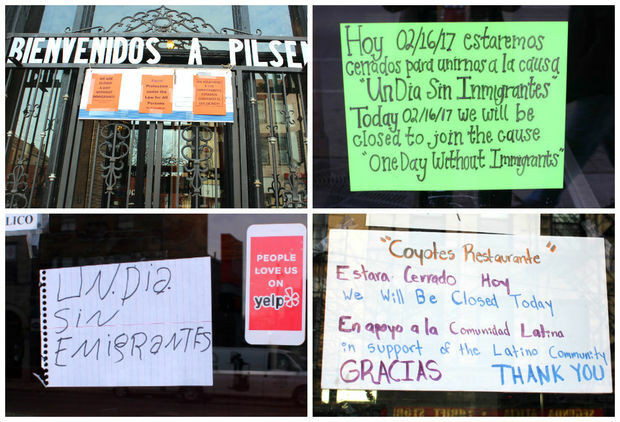 The decision by Pilsen restaurants and shop owners to close came as immigrants from across the country stayed home from workplaces and classes Thursday in an effort to show how important they are to America's economy. 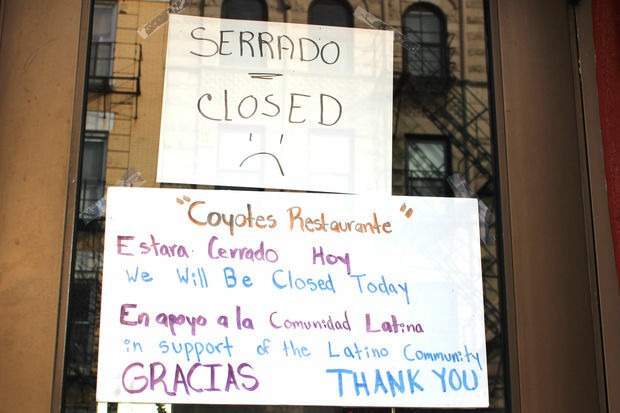 • 5 Rabanitos Restaurante and Taqueria, 1758 W. 18th St.
• BomBon Bakery, 1457 W. 18th St.
"My whole staff asked me not to work. There are a lot of Latinos in the city who want to be part of the movement," said bakery owner Laura Perea, whose bakeries are located in two majority Latino neighborhoods. "As an owner, it's not the best feeling, but I have to understand where they are coming from. I have to support them." • Panaderia Nuevo Leon, 1634 W. 18th St.
• Creperia Nuevo Leon, 1636 W. 18th St.
• La Vaca Margarita Bar, 1160 W. 18th St.
• Don Churro, 1626 S. Blue Island Ave.
• Ram's Restaurant, 2302 S. Blue Island Ave.
• Ciao Amore, 1134 W. 18th St.
• Benny's Pizza, 1244 W. 18th St.
• Fogata Village, 1820 S. Ashland Ave.
• Taqueria El Mezquite, 1756 W. 18th St.
• Supermercados El Guero, 2101 W. Cermak Rd. • La Parada en Pilsen, 2059 W 21st St.
• Small Burger, 1820 W. 18th St.
• Diez Y Ocho, 2000 W. 18th St.
• Lupita's Restaurant, 1723 S. Ashland Ave.
• Azul 18, 1236 W. 18th St.
• Del Toro, 2133 S. Halsted St.
• Taqueria Los Comales, 1544 W. 18th St.
• Memo's Hot Dogs, 1447 W. 18th St.
• Trino's Pizzeria, 1013 W. 18th St.
• Coyotes Restaurant, 1451 W. 18th St.
• Cafe Monsivais, 1637 W. 18th St.
• Escaramuza USA, 1644 W. 18th St.
• Churro Factory, 2214 S. Wolcott Ave.
• Paleteria El Sabor, 1639 W. 18th St.
• Pilsen Law Center, 1545 W. 18th St.
• Eighteenth Street Development Corporation, 1843 S. Carpenter St.
"It's a bigger issue than just, 'We're being targeted,'" said the agency's executive director Alex Esparza, who was born in Mexico. "When you talk about race, you're talking about me." • Pilsen Outpost, 1958 W. 21st St.
• Gadget Rehab, 1549 W. 18th St.
• Revolutionary Lemonade Stand, 2315 S. Leavitt St.
A rally demonstrating solidarity with immigrants living and working in Chicago shut down city streets during its march from Union Park to Federal Plaza Thursday. The National Museum of Mexican Art, 1852 W. 19th St., didn't close its doors, but the museum did support employees who boycotted work Thursday. 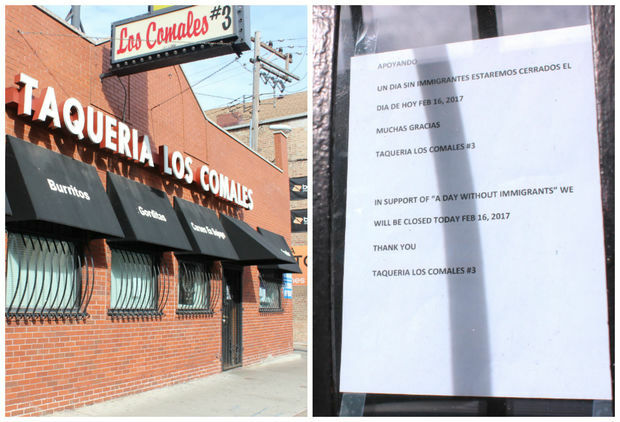 While some Pilsen business owners opted to close, other popular 18th Street spots were open for business Thursday, including Cafe Jumping Bean, La Catrina Cafe and Cantón Regio. 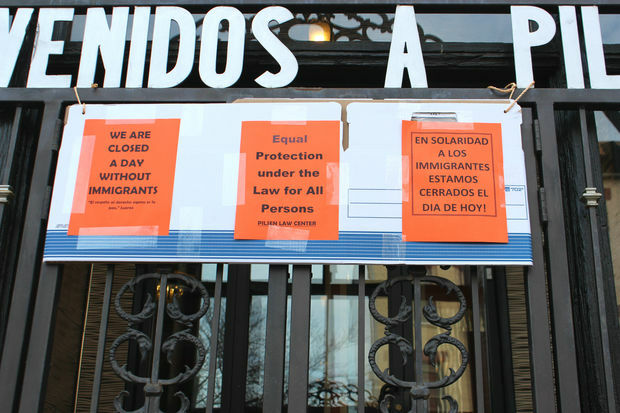 The national Day Without Immigrants movement called for supporters to boycott businesses to illustrate the financial losses that would be felt nationwide if the contributions of immigrants were excluded from the U.S. economy. Chef Rick Bayless was perhaps the highest profile participant: He shuttered Frontera Grill, Xoco, Fonda Frontera and Topolobampo Thursday. Other participating small businesses included L'Patron, a popular family-owned Mexican restaurant in Logan Square, and Pete's Fresh Market, a local grocery chain that has several locations in the city. "A Day Without Immigrants" actions also occurred in cities including Philadelphia, Washington, Boston and Austin, Texas, according to the Associated Press.